I use a news aggregator app called Zite. It is excellent, allowing you to choose from a set of topics that interest you and making recommendations based on your choices. The app collects news articles from sites based on your topic choices, aggregating them together into a single news stream. You can ban particular sites as well, in case Zite pulls from particular news outlets that you are not interested in. What makes Zite special, though, is that it watches which articles you are tapping on and uses this to learn the kinds of articles you are interested in. Even within the category of “Healthy Living”, Zite knows that I am less interested in recipes, and more interested in articles about exercise and research on food production techniques and their impact on human health. My wife also uses Zite on her phone, and you can clearly see how Zite is able to narrow down to particular interests. Her Zite is filled with pop culture articles, and articles about animal welfare. Every now and then, we’ll have the same article pop up on your Zites, prompting discussions of why this would be relevant to both of us (e.g., a pet food recall, which actually is relevant to both of us). 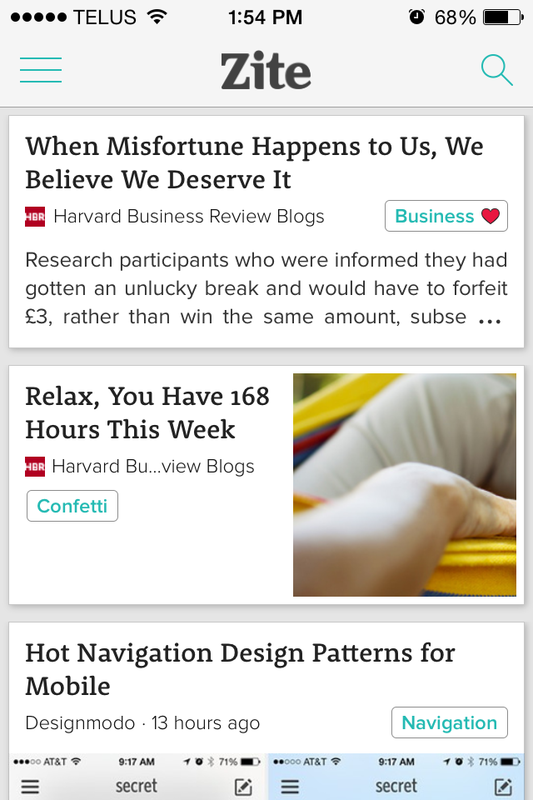 What can we learn from Zite’s approach to help other apps? First, personalization has always been known to be important to make users feel like the app is “theirs”. Allowing people to “theme” the app, like changing background and text colours, is a basic yet effective way to help users feel that this is their app. The lesson from Zite is that personalization can go beyond the visuals, and actually into the content of the app itself. Second, recommendation algorithms are getting really good (think Netflix and Amazon), but they aren’t perfect, so apps should allow users to personalize the actual recommendation algorithm. Zite deals with this by allowing you to “thumbs up or down” particular articles, and even ban a whole news site if you want. This extra level of control reinforces the personalization of the app, making it feel even more yours. Overall, Zite is one of my favourite apps. It is actually the only app I use every day, which is saying a lot given that building apps is what I do for a living. What makes it so great is a combination of providing content that I’m interested in, while ensuring that I feel the content is personalized for me, and only me.